Homepage SANDEMANSs blog History Did David Hasselhoff Bring Down the Berlin Wall? The Berlin Wall stood for 28 years. 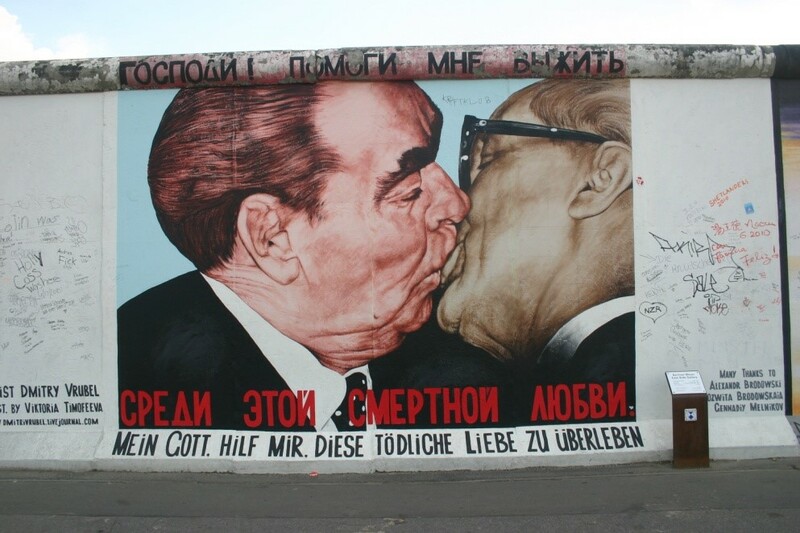 That was 28 years of political, ideological and physical divide between Communist East and West Berlin. Built to keep East Germans from escaping in to West Berlin, at least 138 people died trying to cross the Wall. Many more were imprisoned for attempting. Many, many more wished and hoped that they could cross it. The 155km/90mile long concrete structure was remarkably thin, topped with sewage pipes and only 3.6m tall – yet it (and its Death Strip) was a powerful symbol of the Cold War. Then, overnight on 9 November 1989, it fell down! Not literally of course, it stood for a while longer, and in some parts of Berlin, it stands to this day. But on the fateful evening of 9 November 1989, following months of peaceful protest throughout East Germany, floods of ecstatic East Berliners washed in to an equally excited West Berlin. East Germans had had enough of what many saw as the oppressive and outmoded East German Communist regime. They wanted freedom, Coca Cola, heck just some bananas would be nice (a fruit often hard to get in the East). 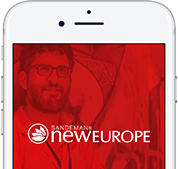 Exactly how this joyous event came about is a gripping story of the will of the people, blundering government spokesmen and confused border guards, and one of the best stories you will hear on the SANDEMANs Free Tour in Berlin. 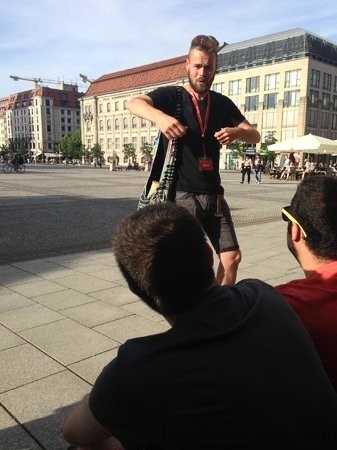 Mark, a SANDEMANs guide in Berlin, delivering his Fall of the Wall story. Look at those hands! But wait, I hear you say. What about David Hasselhoff? Didn’t the Hoff tear down this symbol of division and difference? If you ask David himself, yes. Yes, he did. The Hoff’s hit single ‘Looking for Freedom’ was at Number 1 in the German charts in the summer of 1989. According to him, the power of his lyrics and gyrating hips helped bring down the Wall. Sadly, this is not true, but the Hoff is still disappointed he is not recognised and included in the Checkpoint Charlie Museum (a stop on the Free Tour). But, really, he wins. So many people associate the Wall and the Hoff that the truth really doesn’t matter! 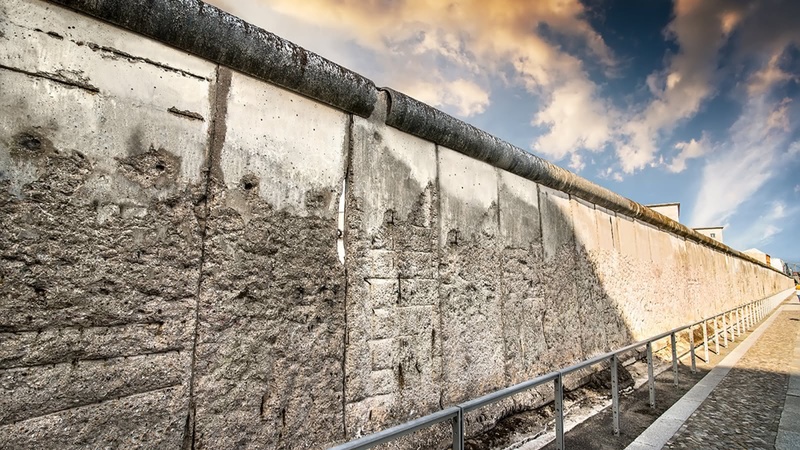 As mentioned, parts of the Wall still stand in Berlin today. The best way to see some of the remaining pieces of this so fearsome structure is to hop on SANDEMANs Red Berlin Tour. You’ll also get an insight in to life in East and West, the history of Communism, and learn about those who tragically lost their lives. You can also check out the longest stretch, the East Side Gallery, and its amazing art work on SANDEMANs Alternative Tour. 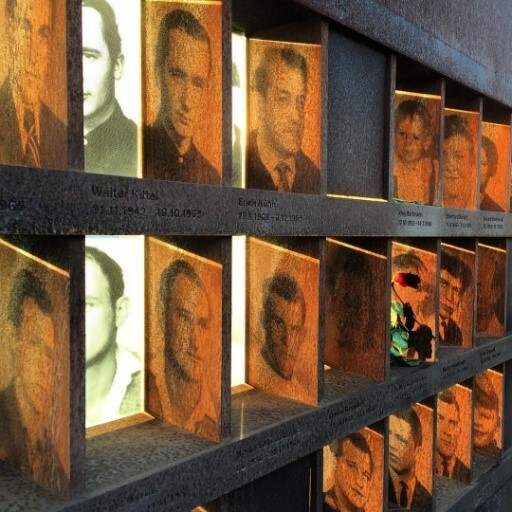 Photos commemorating those who died trying to cross the Wall at the Berlin Wall Memorial, north Mitte.